The Send page enables you to review all of a campaign. Hovering on the thumbnail of the campaign on the left will expand it so you can preview the entire template. You can use the Edit button for the Subject, List, From Name, and Reply-to Email options to make changes to any of these fields. The My Email Balance will show how many emails will be used to distribute this campaign as well as how many will remain. If there is a negative number for Emails Remaining, you can purchase more by clicking on the Buy Emails Here and using the ASI Store. The Save & Close button will save a draft of this campaign that you can send at any time. The Send Email button will send the campaign immediately. 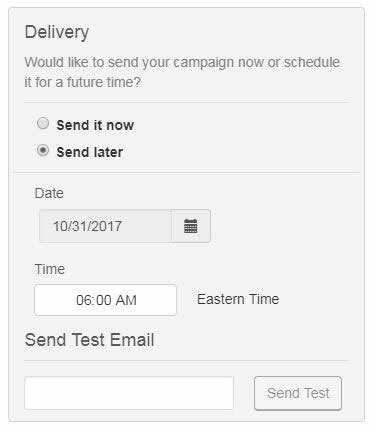 The Delivery options enable you to send the campaign immediately using the "Send it now" option or schedule the campaign to be sent in the future. Select "Send later" and then use the Date and Time boxes to select when you would like this campaign to be sent. To send a sample email to yourself, type your email address in the Send Test Email box and then click on the Send Test button. 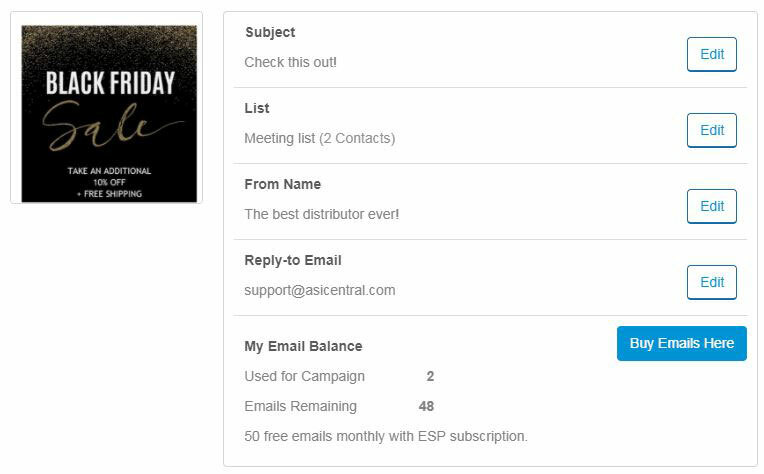 After sending your campaign, you will receive an email with reporting data. This notification email will be sent 72 hours after the campaign. You can also review the campaign statistics using the information available on the Email Marketing Dashboard.